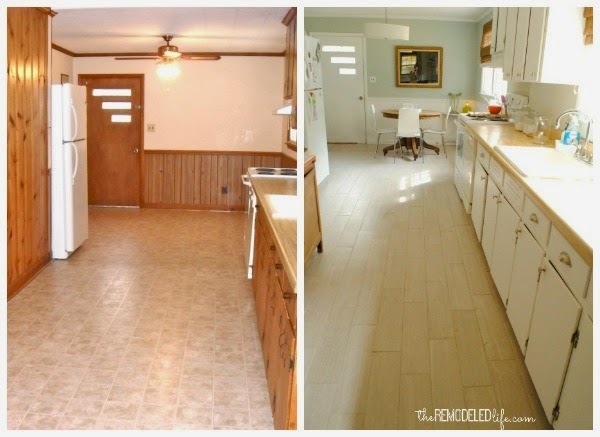 Not too long ago we dove into a project to replace our junky kitchen linoleum with a bright new tile. Changing the flooring in a room is a huge game changer. 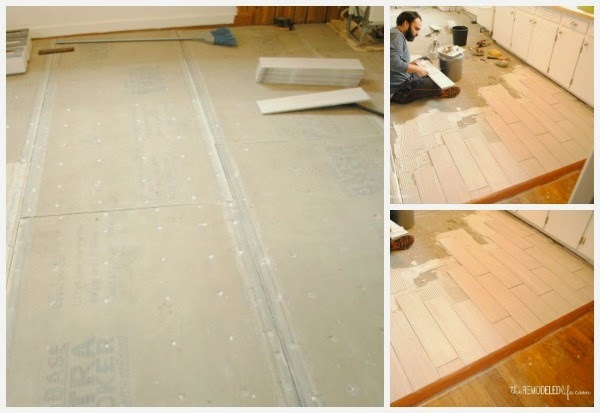 After pulling up the carpet in our house and freshening up our hardwood floors the next logical project was the kitchen floor (especially since our living room and kitchen are open together). 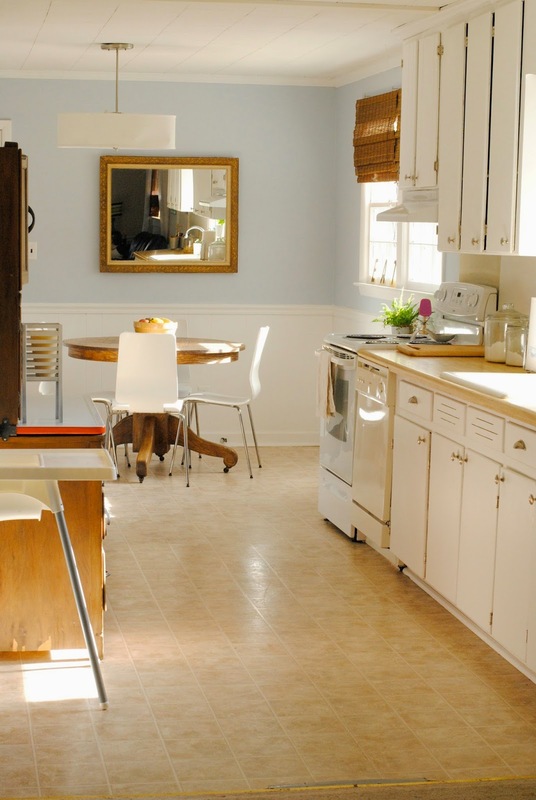 Here's a quick shot of how our kitchen was for a while before we repainted the walls..and changed the floor obviously. If you look closely you can even see the duct tape that held the floor down where it had begun ripping up. I'm pretty sure that tape drove everyone who came over crazy. But, you do what you have to do when you have 1,000 projects in an old house waiting to be done. I wish I had more pictures from this project but it was quite a whirlwind. We started it a week before we were going out of the Country - so great planning on our part. The really awesome factor in this whole thing was Justin's brother (Jason) - who happens to be a tiling professional. We definitely needed his expertise and help. After ripping up the floor is was very much clear that our floor was majorly slanted and laying tile down would be impossible. There was some major floor leveling that had to happen. So thankful for Jason. After we had a level working surface Justin and Jason intalled the duroc and we were finally ready to tile. Even with the floor now level it still was a difficult job considering all of the off angles and such that we still had. But in the end it turned out so great and having a level floor is awesome. Quickly, lets talk tile for a second. We ended up choosing a grayish white plank type tile. It has some lighter grey wood grain design as well. Since we decided to keep the original flooring in the rest of the house I liked the combo of the two floors together where they meet. I love it! This little kitchen has come a long way! Slowly we are checking those projects off the list. Still on the waiting list includes countertops, a backsplash, new appliance, a new door and sink...Oh and flooring trim. There is always something but we have enjoyed the process. Great flooring update! This is the second time I have come across tile that looks an awful lot like wood. 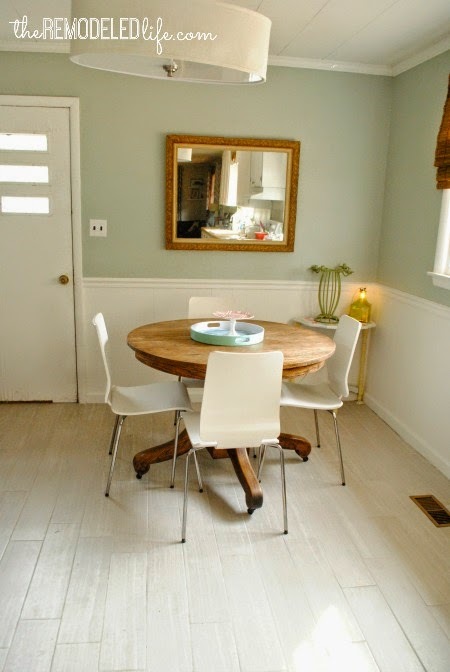 When I first saw your pictures, I figured you had whitewashed hard wood floors. Do you remember where you purchased this tile from? We are considering replacing the tile around our fire place, and I am wondering if I'd like something like the tile you installed for your flooring. Thanks! And great blog!